Some special winter safety tips apply to anyone who owns or works at a power washing business. 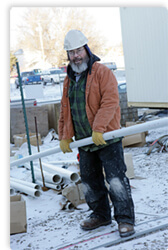 Dealing with cold weather is already tough for people who work outside. However, if the majority of your work includes getting things wet, you will have a few extra guidelines to keep in mind. Using the buddy system is one of the most universal winter safety tips for anyone working with power washers, snow thrower equipment or chemicals. Having two or more pairs of eyes on a site can help to identify risky behavior or dangerous situations. Workers can also monitor each other’s physical conditions and catch symptoms of hypothermia or frostbite before the situation becomes dangerous. Wearing the correct clothing is vital in the winter. Your crew needs to keep covered, dry, and insulated. The tricky part is to find gear which can block the wind and water, yet will also wick away moisture from sweat. It isn’t uncommon to have two different kinds of outerwear on hand for the crew – one that is waterproof and another that is warm but breathable. Switching clothing for different phases of the job may seem a bit theatrical, but it’s easier than dealing with frostbite after the fact. One other set of winter safety tips involves equipment maintenance. Pressure washers can work fine in subfreezing temperatures because water won’t freeze so long as it’s moving. Once the job is done, though, it’s time for preserving your investments. The hoses must be blown out to keep them from being burst by rapidly freezing water. Next, the pressure washer, along with any attachments or tools, must be brought inside or dried immediately. Take care to flush the high pressure pump with clean water, then antifreeze, and then put it away dry. Allowing water to freeze inside that pump could be very expensive. Finally, your pressure washer cleaning solution or chemicals should be kept out of the weather as much as possible, either at the shop or inside the truck in a heated area. Possibly the most complicated of the winter safety tips involves job scheduling. Work can’t stop because of the weather, but the weather can stop certain tasks pretty quickly. Watching the weather reports and scheduling jobs accordingly can keep your crew busy and still help you make payroll. Ladder jobs shouldn’t be scheduled on days where wind and ice will cause problems; those days are best used for ground work. A crew can work in a few inches of snow, but moving heavy equipment around would be a bad idea on those days. There are weather conditions which make any outdoor job dangerous or impossible, but if you put off major equipment or shop maintenance jobs for those days, you can keep everyone working anyway. Finally, regular breaks in a warm dry area with portable space heaters will keep your crew healthy and productive. The most important winter safety tips involve complacency. Neither you nor your crew can afford to ignore the weather reports, job site conditions or individual behavior when working in winter conditions.